What You Should Know Before Buying an Affordable CNC Router? A CNC router is a CNC (Computer Numerical Controlled) machine for automatic carving, engraving, cutting, drilling, milling, grooving, sanding, polishing of solid wood, soft wood, hard wood, plywood, foam, stone, ceramic, plastic, acrylic, glass, MDF, ACM, PVC, copper, brass, aluminum and other soft metals. A CNC router machine is mainly equipped with control system, spindles, servo motors/stepper motors, AC inverter frequency drives, linear guides, ball screws, power supply and workspace table. CNC router table sizes mainly include 2x4, 4x4, 4x8 and 5x10 in feet, some regions may call the table sizes as 1624, 2424, 2448, 4848 and 4896 in inches, some regions may call the table sizes as 4040, 6040, 6060, 6090, 1212, 1218, 1224, 1325, 1530 and 2030 in millimeter (mm). CNC router machines are widely used in industrial production, small business, small shop, home business, home shop, school education and hobbyists. CNC router machine, CNC router table, CNC cutter, CNC carver, CNC engraver, CNC routing machine, CNC cutting machine, CNC carving machine, CNC engraving machine, CNC cut machine, CNC carve machine, CNC engrave machine. A CNC router machine needs at least 3 axis to complete the routing works, called X, Y and Z. The X-axis is horizontal, the Y axis vertical, and the Z-axis refers vertical to the other two axis. A computer "controller" reads G-code or other machine language instructions and drives a tool. The spindle holds the tool, moves along X, Y and Z axis, following the tool path generated by the software. In a 3 axis CNC router, the tool is always vertical, and undercuts are not possible. In addition, some CNC router machines have a rotary axis (4th axis) around the X, Y and Z axis. These CNC router machines are mainly used for some cylinder carving and cutting works. A real 4 axis CNC router refers to X-Y-Z-A, X-Y-Z-B, X-Y-Z-C. four axis are linked, and the four axis can work at the same time. 5 axis CNC router has two additional axis which can move along. These additional axis allow for shorter project time due to their capability of carving five edges of the material simultaneously. The position of the CNC machine is determined by a computer. The computer will tell the motors how much to move in each direction. Any location within the machine’s work area can be defined by using the method of positioning. The CNC machine can be moved within that space. The CNC router machine is connected to a computer, the computer will tell it where to move. First, the CNC machine operator should do the toolpath creation, the operator uses a software program to draw the shapes and create the tool path that the machine will follow. So, when you have some CNC router plans, what kind of CNC router table should be chosen? which all depends on your work needs and budgets. Fixtures, Knife Template Manufacturing, Conveyor Manufacturers, Puzzles, Fan Blade Manufacturers, Name Tags, Artistic Carvings, Kneuls Manufacturing, Orthotic Manufacturing. CNC router tables with different configurations and specifications have different cost. CNC router machines from different brands have different service and support. CNC router machines from different countries have different tax rates, different customs, different shipping costs. All of these factors will lead to different prices. You will get a price range of $2,000.00 to $180,000.00 from STYLECNC. STYLECNC is a guaranteed CNC router manufacturer, supplier and seller. STYLECNC offers all kinds of best CNC routers for sale to fit your works. STYLECNC's CNC router machines are equipped with genuine software and system, original kits, bits, parts, tools. 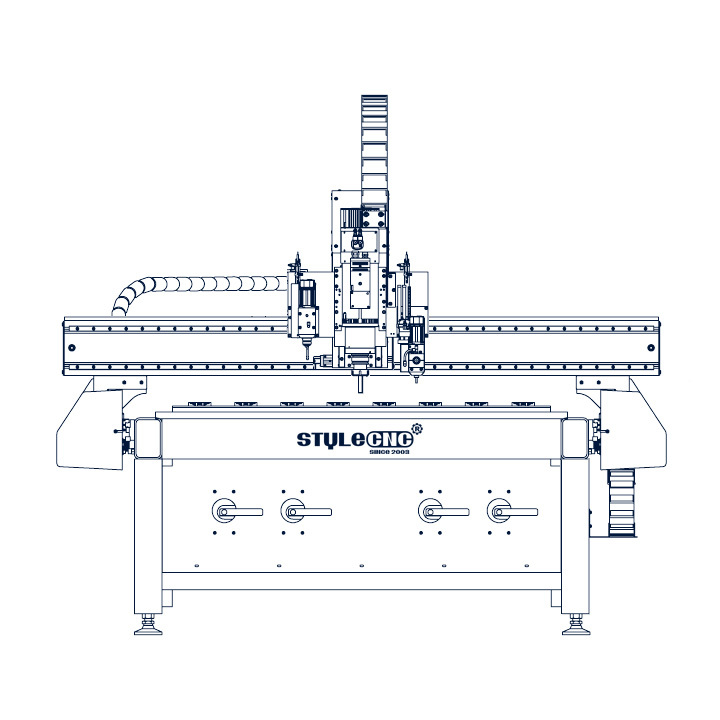 STYLECNC offers ex-factory price for your CNC router plans without any intermediate. You will get the best CNC machines with affordable price from us. STYLECNC also offers the all-round smart CNC solutions, 24/7 one-to-one free service and support, which is available free. I have to say this smart glass carving machine is brilliant. It covers big range of my works and the this company have the most helpful service with guiding and introductions. I would like to recommend this machine to my friends. I really like the 3 axis CNC machine. When I received this machine, it was completely packaged and included with various training videos and user manual. I used it to make a wooden door and the effect was great. This machine is really suitable for my work. Thanks to the help of STYLECNC. I am Sergei from Canada, our company mainly customizes foam molds for our customers. We have received the CNC foam cutter more than one month, until now this machine is running very well, It is very helpful for our business. I have purchased this CNC wood router to make my art statues and I have to say this is the most suitable machine for art. I REALLY love this CNC foam router. It makes my foam work much easier. Full automatic, high precision. Just purchased this 5 axis CNC router a month ago and it is still working well. I am glad that I found this 5 axis machine and it is really convinient for my 3d carving works, it made the whole process much more simple. I like it. I got the 3d stone carving machine for our tombstone business, it's a good machine with high working efficiency, we like it very much, and we plan to buy one more laser machine for engraving stone. After my 5 axis machine was ready, I went to their factory for training. Their company was really professional, and their engineers taught me a lot. I‘m going to buy some other CNC machines from their company. All recieved as described. Safe and reliable transaction. I already introduce STYLECNC to my friend. Great, I'm very satisfied with the quality of this 5 axis CNC router machine. My machine has been in production for half a month. My products are also very popular with customers, I really appreciate STYLECNC.